Ultimately, the agency itself may have been bilked, and if coked-up, permed FBI agent Richie DiMaso (Bradley Cooper) bears any resemblance to his real-life counterpart, it's easy to see why. Drawn to the allure of the beautiful, confident Sydney—whose British accent sounds more like what an American believes a Brit should sound like—Richie keeps expanding the game board on which he's set loose his charges. Soon, it's not just local politician Carmine Polito (Jeremy Renner) who's the target, but also mob boss Victor Tellegio (Robert De Niro), U.S. congressmen, and even a two-term Senator (a cameo by Anthony Zerbe). The lure is an Arab sheik—portrayed by Richie's Mexican FBI colleague (Michael Peña) in violation of Irving's "from the feet up" prime directive—looking to invest millions in a casino that will provide thousands of jobs to Polito's constituents. Yeah, Richie might be getting hustled, but for that matter, aren't we? At a glance, American Hustle looks and sounds like a Scorsese movie: De Niro's presence as a Mafioso; whip-pans and zooms; sharp editing that quickly cuts to flashbacks illustrating an important point being made; multi-perspective narration. And then there's the classic rock soundtrack. But in reality, Russell is deliberately informing this world with the bare, almost parodic signifiers of the typical Scorsese gangland film, a la Goodfellas or Casino. There is a purposefulness to the fact that these hallmarks are so shallow, subliminally indicating that no matter how well drawn, each of the movie's characters, on both sides of the law, carry their own similar measure of artifice. The mostly honest Polito is willing to take a bribe in order to more quickly realize a promise to his voters. Richie wears curlers at the home where he still lives with his mom and a secret fiancée he's ashamed of. Roslyn casts a blind eye to her husband's criminal and sexual side activities as long as she is well cared for. Perhaps the most opaque are Irving and Sydney, two swindling lovers whose confidence game runs so deep, both we and they aren't ever exactly sure if they're playing each other as well as everybody else. 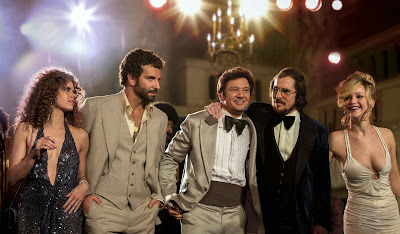 If there's a flaw in American Hustle, an otherwise congenial, pitch-perfect comedy-drama, it is that it continues the trend Russell began in The Fighter of completely ironing out any of his own personality from his films. As finely etched as American Hustle is, it is due to the performances he's drawn from the ensemble he's put together rather than any auteurial preoccupations one might grasp from his previous films. Chief among these is Adams' portrayal of Sydney; she's never looked hotter or more wrecked than she does in this, approximating the full range—from icily defiant to flaming out in her trauma—of a character that could easily be mistaken for a cypher. Bale is nearly unrecognizable; pot-bellied and wheezing when he's not sputtering out Bronx-accented colloquialisms. Even Cooper and Lawrence, two of my least favorite actors, seem liberated by the fact that they aren't restricted to their usual screen personas. American Hustle is not the best film of the year, nor does it even come close (despite its recent win for the honor by the New York Film Critics Circle). But it is as incredibly attractive and beguiling as its duplicitous cast. That's more than you can say for other awards contenders. Horrible movie with overacted performances like christian bale, bradley cooper and jennifer lawrence.